A flashing check engine light is typically indicative of a serious problem affecting your vehicle’s ignition, fuel or emission systems. If your check engine light is on or flashing, it’s time to come to AutoImports of Denver for a car diagnostic. Our auto service professionals will investigate the check engine code error and troubleshoot the problem. If you delay a car diagnostic or necessary engine repairs, the problems and costs can quickly escalate. Today, it seems that more people are “price shopping” than ever before, but this doesn’t really help anyone. As the saying goes, “You get what you pay for,” and this is especially true in the auto repair field. If you don’t pay for auto diagnostic service, such as offered by various autoparts stores, what exactly are you getting? Do You Really Want To “Chance” So Called “Free” Auto Diagnostic Services? The truth is, at best, you’ll get a printout of the DTC and a “guess” as to what the problem might be. It’s an autoparts store, after all, and their business is selling parts, not necessarily fixing cars. At worst, you might buy parts that don’t end up fixing the problem. In the end, you got a “free” auto diagnostic check, but you wasted time and money on unnecessary parts. Where’s the value in that? On the other hand, if you pay for auto diagnostic service (the average is between $150-$250) where’s the value in that? 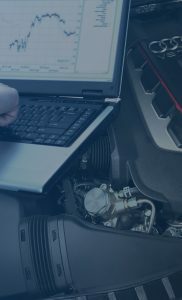 Most auto repair shops employ ASE-Certified technicians, who spend thousands of hours in training and working on cars every day, and also maintain thousands of dollars in modern auto diagnostic and repair tools. If you have a check engine light, trained technicians use state-of-the-art diagnostic tools to give you an accurate diagnosis.